During the seasons of Advent and Lent, St. Pius X Parish, as well as all the local parishes, will have communal celebrations of the Sacrament of Reconciliation. Watch the bulletin for information on dates and times. 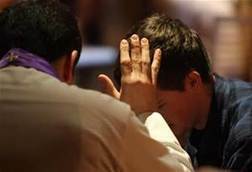 To learn more about the Sacrament of Reconciliation refer to paragraphs 1420-1498 of the Catechism of the Catholic Church. Parishioners who are sick, home bound or in nursing homes may arrange with the Pastor for regular reception of Holy communion by calling the Pastor or the Parish Office. to learn more about how St. pius x catholic church prepares for and celebrates the sacraments, click on the links below.